New line of Wellness Teas combines Tulsi (Holy Basil) with other herbs to address specific health concerns. ORGANIC INDIA launched a new line of wellness teas designed to address specific health concerns. Each of the four teas contains Tulsi (Holy Basil) blended with other herbs that offer distinct benefits. Tulsi Cleanse includes Krishna Tulsi, Turmeric, Ginger, Bhumyamalaki, Katuki and Kalmegh and is designed to be an effective daily liver and kidney cleanser. These restorative herbs support the body’s healthy detoxification system by optimizing liver and kidney function. Tulsi Lax blends Rama Tulsi, Fennel, Coriander, Cardamom, Cinnamon and Senna to create an effective herbal laxative tea. 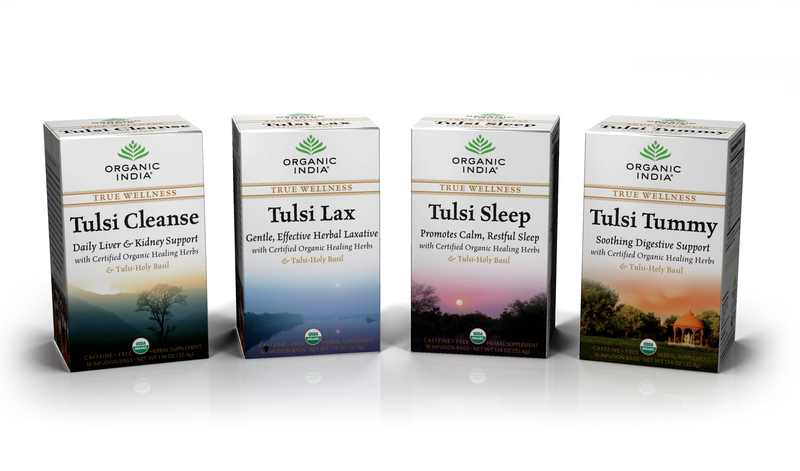 Tulsi Sleep is a blend of Krishna and Vana Tulsi, Brahmi, Ashwagandha, Chamomile, Cardamom, Peppermint and Shankpushpi. By providing the deep, restorative energy needed for healthy sleep, Tulsi Sleep promotes a calm, restful slumber. Tulsi Tummy combines Vana, Krishna and Rama Tulsi as well as Ginger, Cinnamon and other calming herbs to provide effective digestive support. This delicious and effective blend of healing herbs supports, soothes and settles the stomach and digestive system. ORGANIC INDIA’s Wellness Teas are available at retail stores and online at http://www.organicindiausa.com. Each box contains 18 tea bags with a suggested retail price of $5.99. ORGANIC INDIA works with thousands of family farmers in India, cultivating tens of thousands of acres of certified organic farmland. The farmers are commissioned to grow organic crops, which ORGANIC INDIA purchases at a premium market price. ORGANIC INDIA supports their farmers by providing training, health care and education that enable them to be self-sufficient and to develop organic farming skills that will be passed on to future generations. ORGANIC INDIA markets certified organic, biodynamic and ethically wildcrafted products throughout India, the United States, Israel, the United Kingdom, the Czech Republic, Japan and Australia. To purchase products or for more information, please visit http://www.organicindiausa.com.